Help Stop Motorcycle Abuse of the Swan Crest! Motorcycle illegally crossing the outlet of Lamoose Lake, 8/18/12. 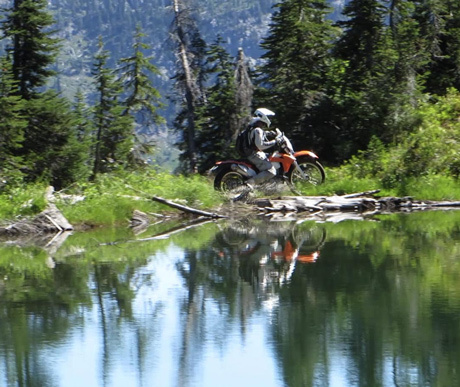 Motorcycles again this summer were captured in video and photos operating illegally off-trail near Lamoose Lake, as well as causing deep rutting of Alpine Trail #7 where their use is currently allowed. 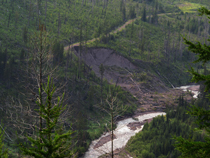 Read on to see photos and video of this damaging activity and for a link to email your complaint to the Forest Service. It’s high time to get motorcycles out of the high alpine country along the Swan Crest! 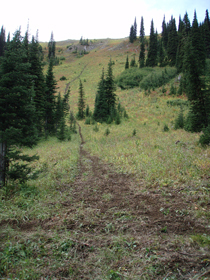 Even on Alpine Trail #7, where motorcycle use is currently allowed north and south of Jewel Basin, they are causing ruts so deep that they are moving over and creating duplicate trails! 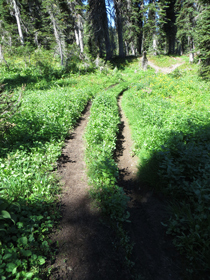 The braiding of these trails and their damage to high alpine soils and vegetation is largely why Jewel Basin was designated a hiking-only area in the 1970’s. In past summers, we’ve repeatedly reported motorcycles hill-climbing illegally above Alpine Trail #7 and spinning circles in pristine meadows along it. This summer, we saw them running illegally off-trail at Lamoose Lake, crossing its outlet and the meadow above it. See the large photo above and click here to see the video. Let’s all urge the Forest Service to close Alpine Trail #7 and its feeder trails to motorcycles so law enforcement can get a handle on the problem right at the end of the road! 1. The high alpine country along the Swan Crest is too fragile for motor vehicles, either on or off designated trails like Alpine Trail #7. 2. Off-trail motorcycle use continues to occur regularly in spite of signs posted along Alpine Trail #7, which are unsightly to begin with and often torn down to become litter. 3. Close Alpine Trail #7 and its feeder trails to motorcycles, so the signs and law enforcement can occur right at the end of the road and truly protect the Swan Crest. Thank you for taking a few moments to help secure the Swan Crest for fish, wildlife, plants, and people!